Participatory budgeting (PB) is democracy in action: with PB, community residents directly decide how to spend part of a public budget. PB began in Brazil in the 1980s, when residents of the city of Porto Alegre voted on how to spend the mayor’s budget to address community needs. Since then, municipalities, counties, and cities across the globe have adopted PB, and the United Nations has promoted it as a best practice of democratic governance. Every PB process is different, but in all cases, public officials across jurisdictions give residents access to different pots of public money—such as a school’s discretionary funds or a city’s multimillion-dollar budget discretionary line. People then come together to decide how to use that money to address the particular needs of their own community. PB Chicago is broad coalition of aldermen, city agencies, community-based organizations, and residents working to implement and expand PB processes and direct democracy throughout Chicago. Since 2012, Great Cities Institute has been the lead university partner on PB Chicago, responsible for stewarding the initiative, as well as providing overall project management, training and technical assistance on community engagement, and evaluation. How does PB work in Chicago? In 2009 residents of Chicago’s 49th Ward held the first PB vote in the United States, led by Alderman Joe Moore. 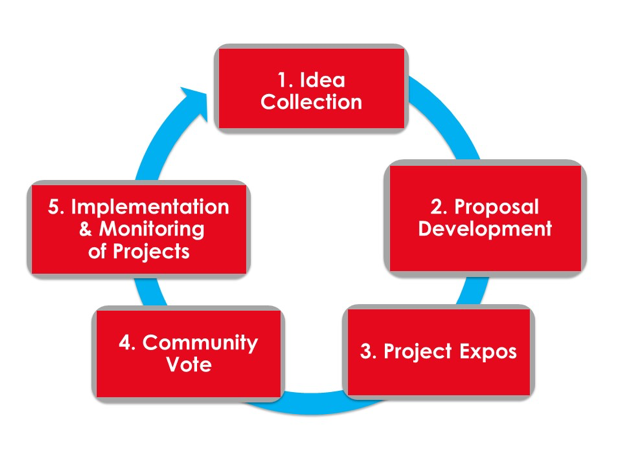 In 2012, the third year of PB voting in Chicago, PB Chicago was formed to help support, implement, and expand PB processes across the city. Since then, Chicago residents in participating aldermanic wards have voted on how to spend the $1 million in “menu money” for infrastructure improvements that City Council allocates to each ward. PB Chicago has successfully implemented six voting cycles across the city (and currently is in the seventh cycle), engaging more than 26,000 residents in 12 wards in directly deciding how to spend approximately $31 million on over 160 community projects. With the support of Great Cities and its coalition of PB supporters around the city, in recent years PB Chicago has supported and expanded menu-money votes around aldermanic infrastructure funds. PB Chicago also led the country’s first PB process with tax increment financing money in the United States, a vote that was held in Chicago’s West Humboldt Park community. And in 2017, PB Chicago began working with Chicago Public Schools to pilot a PB-based community engagement program for high-schoolers. In 2018, PB Chicago partnered with Our City Our Voice to continue providing technical assistance and support to PB processes across the city. In all this time, Chicago residents have fixed streets and sidewalks, improved parks, built out biking and transit infrastructure, updated libraries and schools, and more. For an interactive map of winning projects, see our the PB Projects Map. For more information on PB in Chicago, visit the PB Chicago website.